Patricia Young-Chou, her husband William Chou, and their two kids: Hudson (13) and Amira (10). 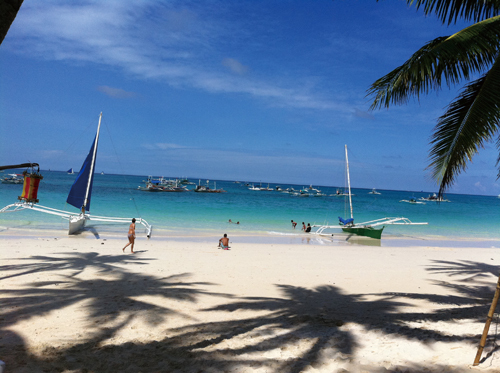 The Chou family visited the island of Boracay in the Philippines during the October national holidays. They took a direct flight from Beijing to Manila, then booked their own domestic flights through local airlines like Cebu and Zest Airways to reach their final destination. Depending on whether you fly into Caticlan or Kalibo Airport, it’s either a bus ride or a 10-minute ferry ride to reach the island of Boracay. The Chou family did not use a travel agent, and instead planned their own trip from beginning to end. Direct roundtrip flights from Beijing to Manila with Air China cost RMB 25,000 for the entire family. Once in the Philippines, domestic flights cost an additional RMB 1,500. In Boracay, at Ron’s Rendezvous Resort, five nights in a two-bedroom bungalow cost around RMB 2,550. Transportation cost around RMB 300, or RMB 15 per ride on motorized rickshaws. Not including shopping and food expenses, the Chou family vacation was roughly RMB 30,000. In Boracay, Calypso Diving Resort offered a great PADI-certified scuba diving program for kids. The white sand beach and weather were superb, and the water was clean and warm. Amira and Hudson enjoyed scuba diving, while Patricia and William took a boat ride to the other side of the island on a banka (a type of sailboat). They got their very own captain, who took them to a more remote location called Puka Beach. Along the way, they did some snorkeling. On a red-eye flight from Beijing, they stayed at Manila International Airport from 3am to 5am, before checking in for a domestic flight to Boracay. They found out in-flight that their plane was being redirected to Kalibo rather than Caticlan. That means they had to take a 90-minute bus ride to reach the ferry that would take them to Boracay. On their way back to Manila, they also encountered a three-hour delay at a tiny terminal with nothing much to offer. Everyone was really friendly on the island. ATVs and motorized scooters can be rented by the hour. Many types of cuisines are offered at D’Mall, the main outdoor shopping center along the beach. A must-try is the delicious fresh mango shake. English is widely spoken and understood in the Philippines. A tour guide is not required, because you can negotiate with the motorized rickshaw driver for a tour of the island. Be sure to bargain. If lying on the beach all day isn’t your cup of tea, there’s a range of activities suitable for all ages. Amira and Hudson enrolled in a four-day scuba diving course at Calypso Diving, where they earned their PADI Junior Open Water Diver’s certificate that is recognized worldwide and is valid for life. To relax, there are cheap spa treatments available right on the beach. While planning their trip, Patricia looked up forum posts on sites like TripAdvisor.com. She recommends packing light and avoiding wheeled luggage, since you’ll be stepping right off the ferry into the sand. However, there are porters for hire, who will load and unload your luggage for only RMB 15. There’s a recently-opened five star Shangri-La hotel on the island with its own private beachfront, but the family opted for a budget-friendly bungalow owned by a very sweet couple that was just steps away from the beach. Though Ron’s Rendezvous is nothing glamorous, the hotel offers free Wi-Fi, daily breakfast, and your own hammock on the front porch. Amira and Hudson enjoyed the latter more than the cable TV inside the room. Boracay had lots to offer when it came to food. D’Mall was a good choice, as was Talipapa Market, which sells live seafood made-toorder. In the evening, White Beach has an array of all-you-can-eat buffets with bottomless ice teas starting at around RMB 40. Some of the seafood on offer includes fresh mussels, oysters, and clams. Dining establishments sometimes offered entertainment, such as fire dancers and live bands.